Second hand cross cut pack cutting machine | DELTA S.r.l. Looking for info and pricing on this Second Hand Pack Cutting Machine? Call the number +39 051/6800360 or send your request by mail to info @ deltaitaly.com. You can share this on the main social network. The hydraulic X-Master Nailer produces large pallets (max 2100mm in lenght to 2500mm in width). 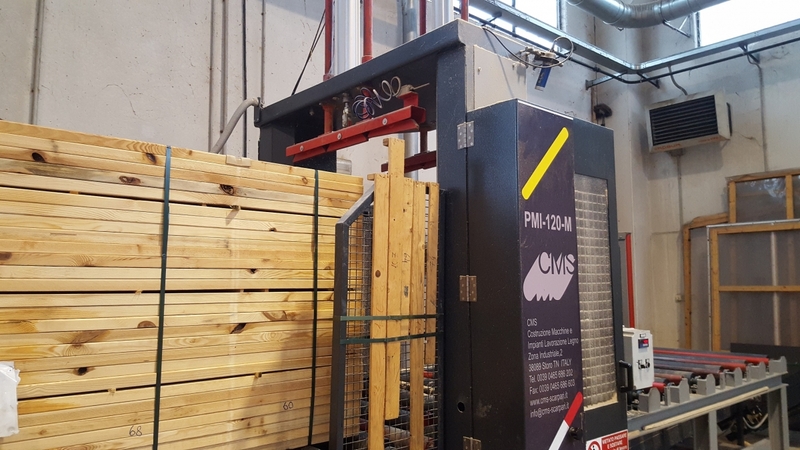 The hydraulic Master Nailer produces large pallets (max 3000mm to 1350mm in width). Nailing machine with quick format change-over for companies with an average-high pallet production output. The nailing machine with belt is ideal for companies with high pallet production outputs. The line includes machines and equipment which, assembled on the basis of a customized project, yield a finished product. Pack-cutting machine which cuts from bottom to top, conceived to effectively handle the considerable weights it is used to process. Fully managed by PLC logic. Highly productive block-cutting machine which ensures outstanding quality with reduced operating costs. Using the thermic stamping machine the operator can brand the pallets. Equipped with 4 or 6 customizable branding heads in bronze. This auxiliary equipment allows the machine to smoothen the angles of the pallet by means of a cutting sequence at an angle of 45°. Auxiliary machinery in tubular steel structure which allows the machine to rotate the pallets by 90°to prepare them for the following processing operations and to ensure proper stacking. The machine allows the operator to tilt the pallet on itself through a piece of equipment that incorporates a vice run by pneumatic cylinders. By means of a tilter with rotary belt and steel structure, the pallet is rotated by 180°. It is also configured to perform the transfert function. Chamfering unit for in-line deck boards in tubular structure with cutting depth adjuster. Equipped with 6 cutters from the top (for CHT). Chamfering unit for in-line deck boards with tubular steel structure and cutting depth adjuster. Equipped with six cutter from the bottom (for CHA). 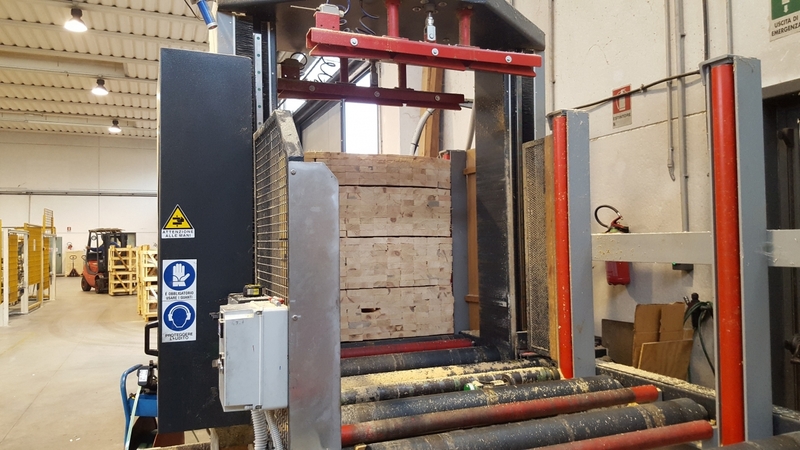 Automatic feeder that allows the machine to load blocks that are already cut in the nailing machine without the need for the operator to intervene. An optional equipment of the block-cutting machine that allows the operator to double the productive capacity while maintaining cutting precision and speed. Accessory that enables the automated lateral movement of the pallets by means of an alignment barrier. The terminal part of the stacking unit, the warehouse allows the operator to unload the processed pallets. It is equipped with a photocell to the stop the machine when the warehouse is full. Assembled on a mobile counter, thanks to a pneumatic cylinder, the device adjusts the automatic scrapping of the head and tail of the joist.